All streets in the area bordering the ICE facility have been closed but police hoped to have them open later Wednesday morning. 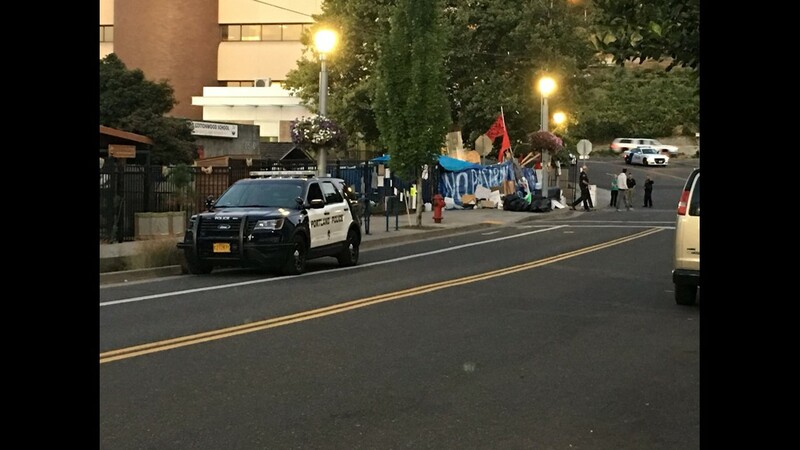 PORTLAND, Ore. — Police cleared out the Occupy ICE PDX encampment at 4:30 a.m. Wednesday with an announcement on social media, and at the site via bullhorns, that any remaining protesters must leave. 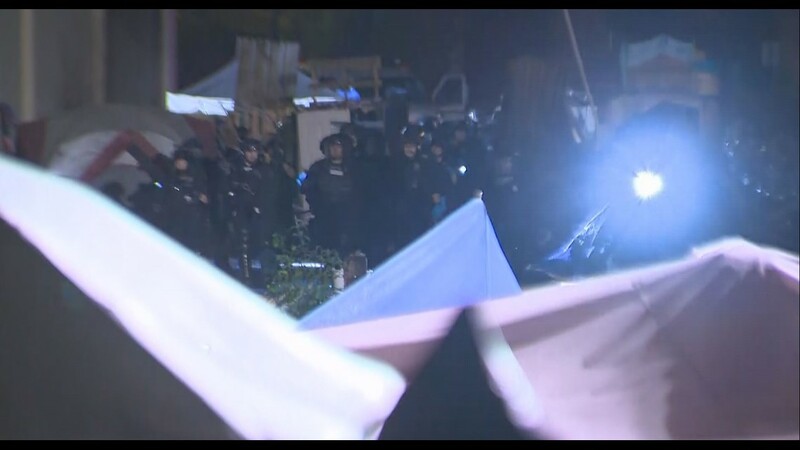 Officers in riot gear ordered bystanders to move out of the camp. 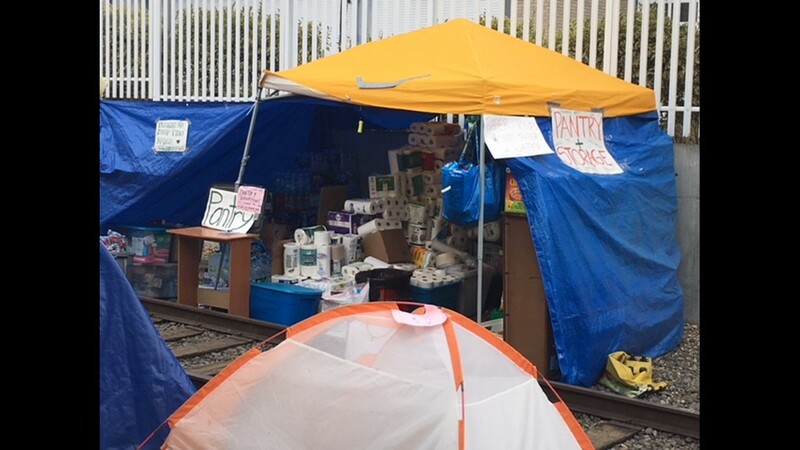 Those who were still in the camp, less than a dozen people, were told to leave through the north entrance and remain at least a block away. 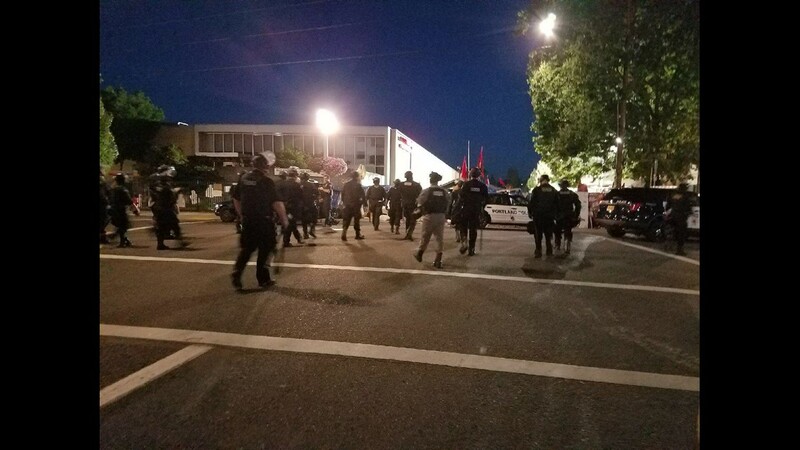 Officers swept through south to north. "People ask, 'well, why did it take so long?' Actually, I think the timing was very good on this. 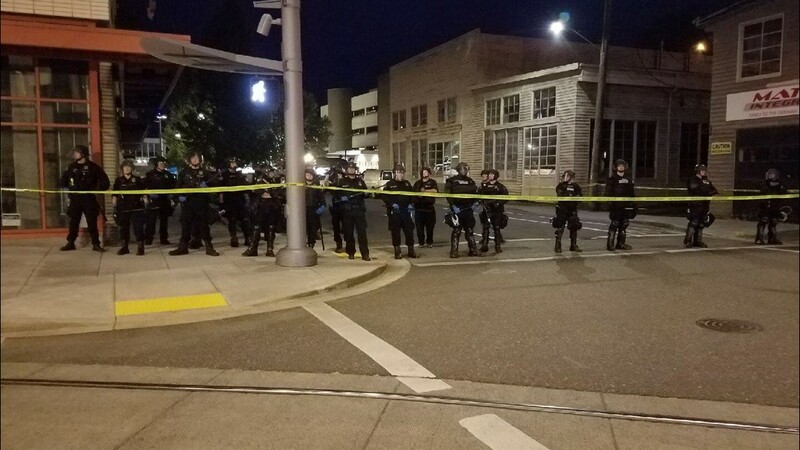 The whole point was to keep the situation contained to make sure it’s deescalated (and) prevent a riot-type scenario," said Portland Mayor Ted Wheeler. Police spokesman Sgt. 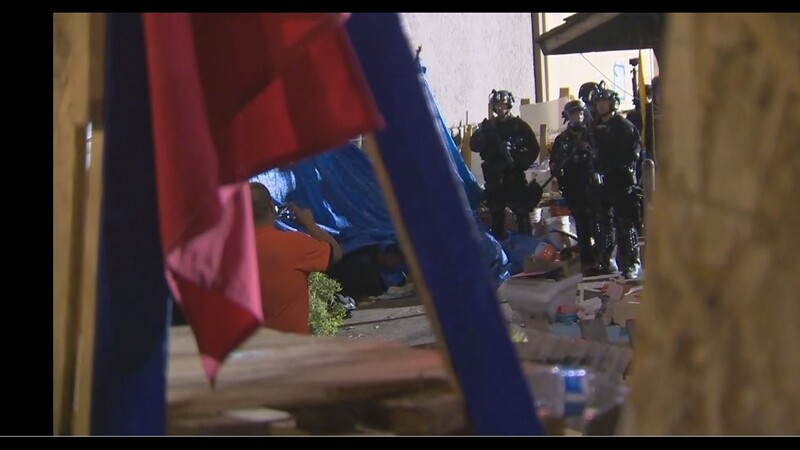 Chris Burley told KGW that police moved "slowly and methodically" through the encampment, with no one injured or arrested. 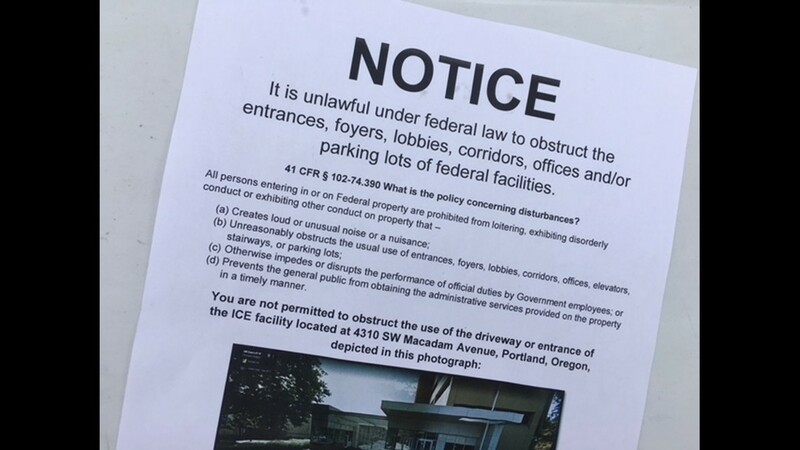 All streets in the area bordering the ICE facility were closed, but police hoped to have them open by late Wednesday morning. 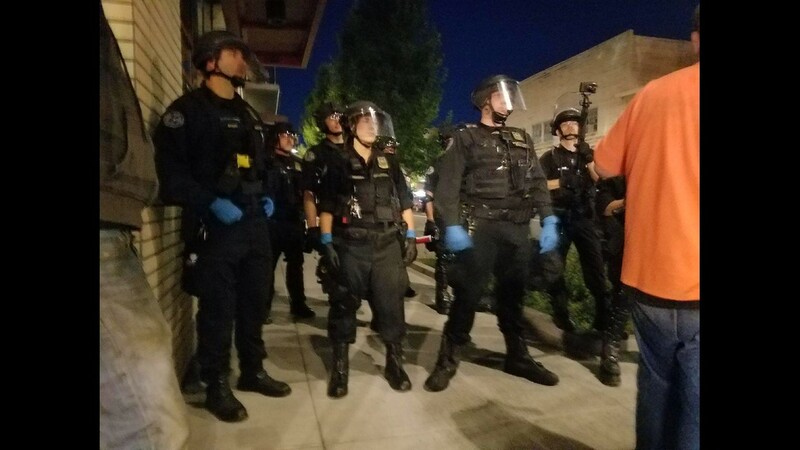 A protester who went by the name Badger said police moved in with aggression, in a militaristic fashion, yelling at people to "move, move, move." 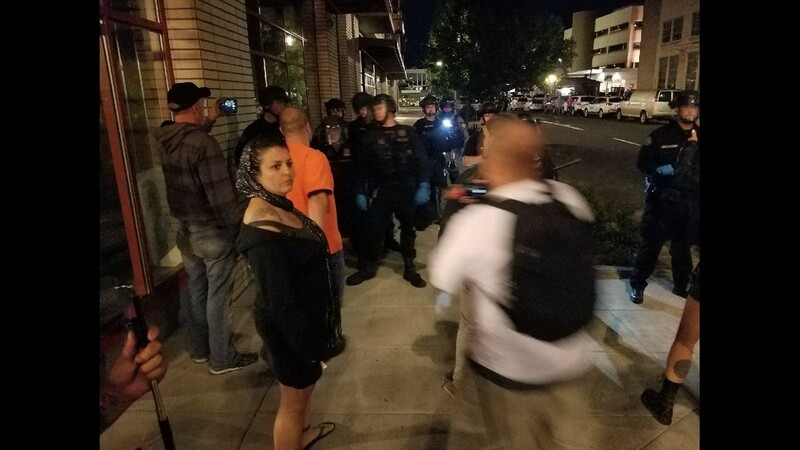 He said they made threatening motions with their batons and flipped down their visors to suggest tear gas was imminent. "The level of aggression was uncalled for," he said. 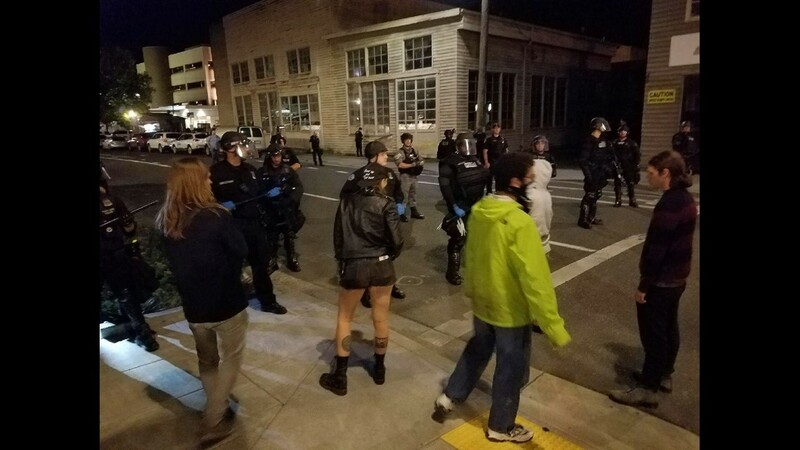 Counter protesters were also present and there was a minor scuffle as police started to sweep the area. 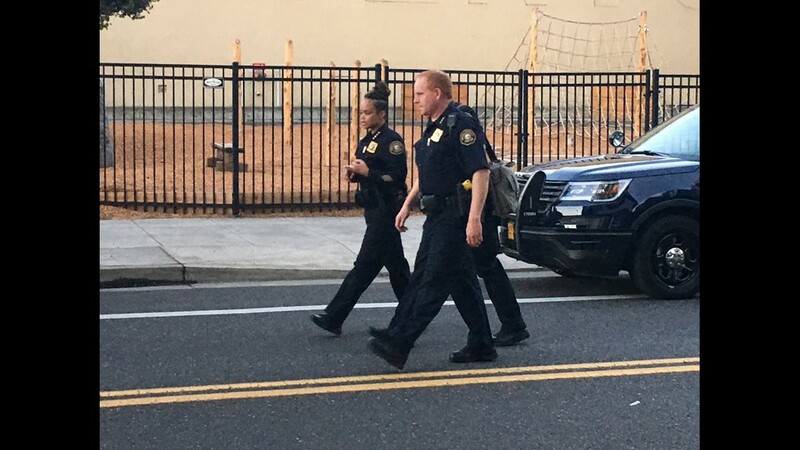 Chief Danielle Outlaw said the use of a baton by an officer trying to separate people in that incident was the only time a baton was used Wednesday morning. She did not address the actual scuffle. 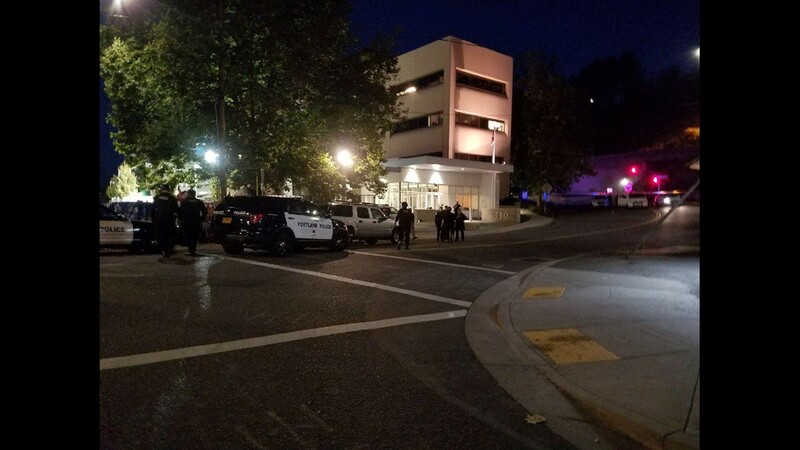 Outlaw said that last week she and her command staff determined that conditions at the occupation had deteriorated to the point where health and fire safety issues were a cause of concern. 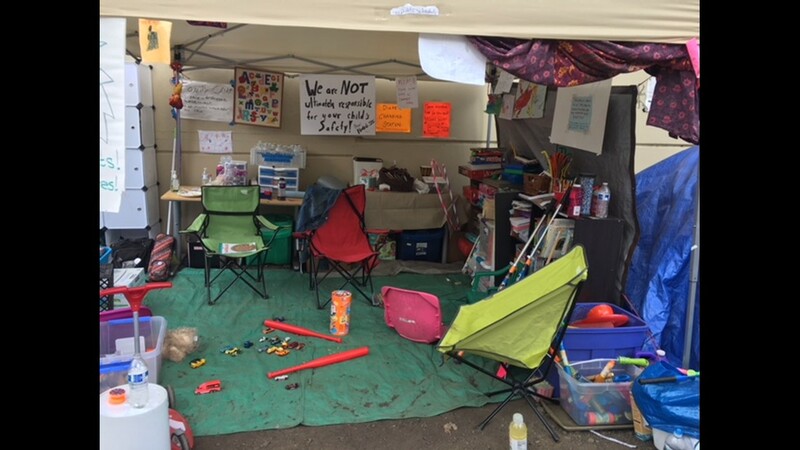 There were 76 calls for service to the protest area during the occupation and 13 online complaints, centering on the behavior of the protesters and concerns about the conditions at the camp, she said. She brought the concerns last week to Wheeler, who quickly agreed that steps needed to be taken, Outlaw said. 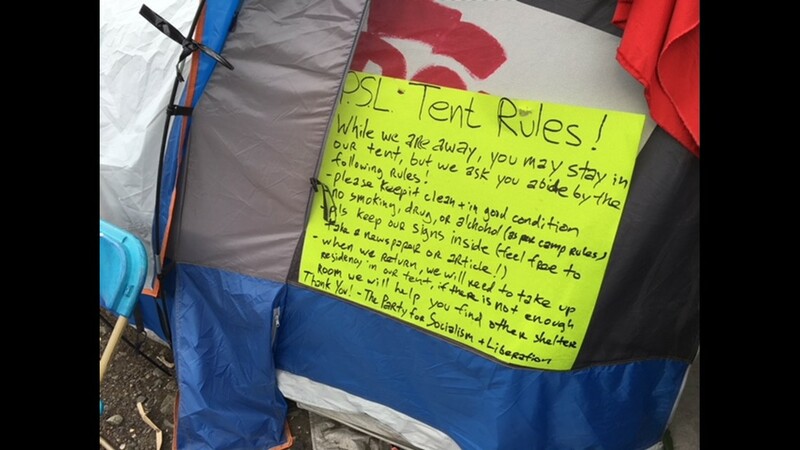 Asked if the occupation camp should have been closed earlier, Outlaw said, "I leave the politics to the politicians." 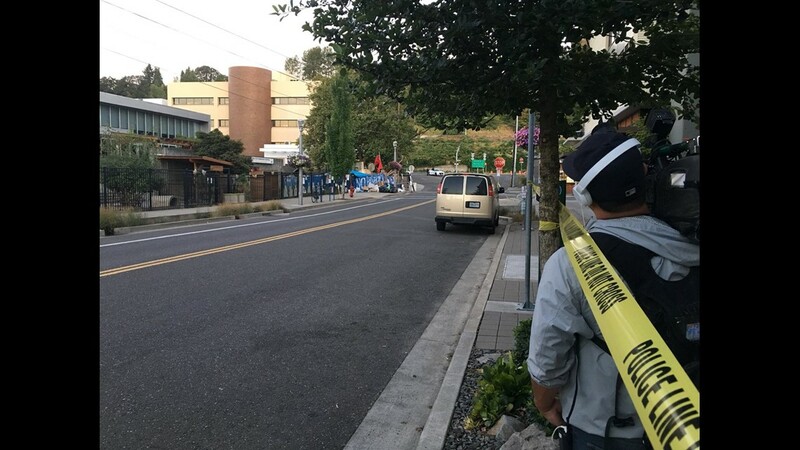 A bomb disposal unit and the Portland Fire & Rescue Bureau were on scene Wednesday morning only as a precaution. Items of value seized in the Wednesday morning action, including couches, bookshelves and kitchen equipment, will be available until Sept. 1. 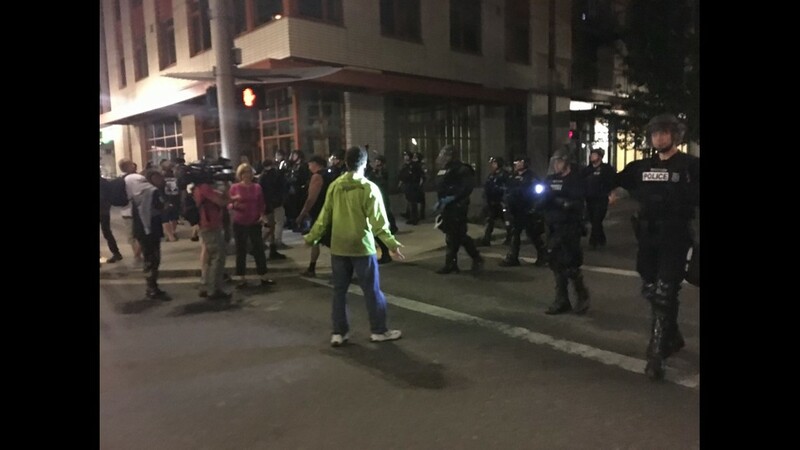 "I’m just glad it’s been resolved peacefully and that there’s been no arrests or incidents today," said Wheeler. 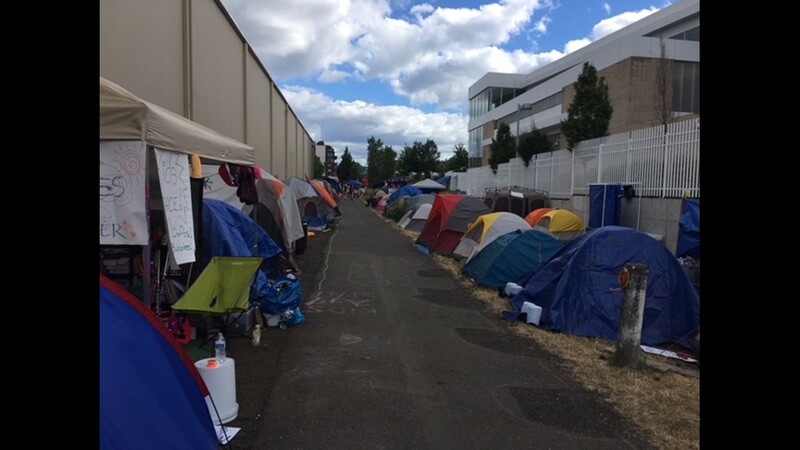 Wheeler's office said Monday afternoon that protesters had until midnight on Tuesday to leave the Occupy ICE PDX camp near the U.S. Immigration and Customs Enforcement holding facility in Southwest Portland. 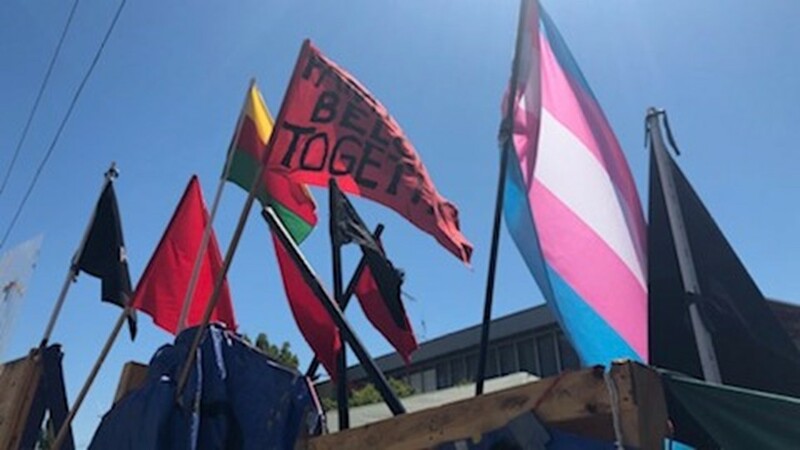 Eviction notices were posted at the camp and Wheeler announced that the city is encouraging protesters to "peacefully disengage." 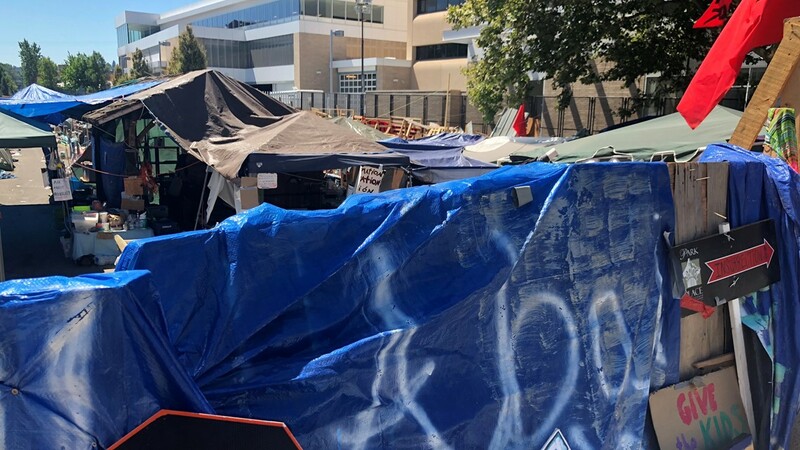 By Tuesday evening, less than two dozen campers remained at the camp. 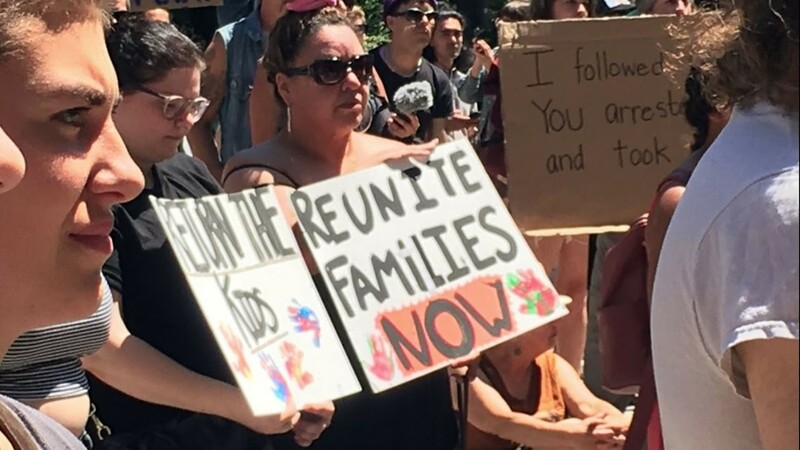 Some protesters from the group Abolish ICE announced they were leaving because the camp was hurting the cause. 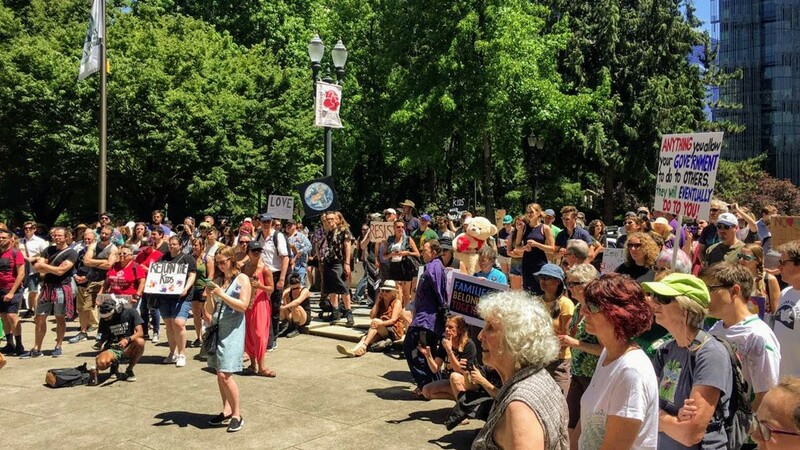 For the first five weeks of the occupation, Wheeler, who also serves as police commissioner, had declined to involve the Portland Police Bureau in the demonstration against U.S. Immigration and Customs Enforcement. "It’s time to move on to the second phase of this. To a more sustainable front that focuses on immigration policy over the next months and years," Wheeler said on Monday. Wheeler didn't say then how he planned to clear the camp. "I don’t think we’re in a position to reveal any tactics," Wheeler said. 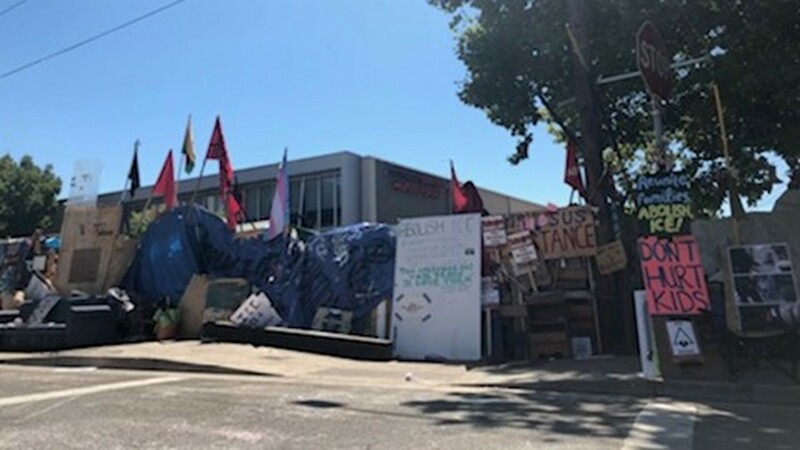 Occupy ICE PDX responded to Wheeler on Facebook by saying, "We move when ICE moves, Ted." 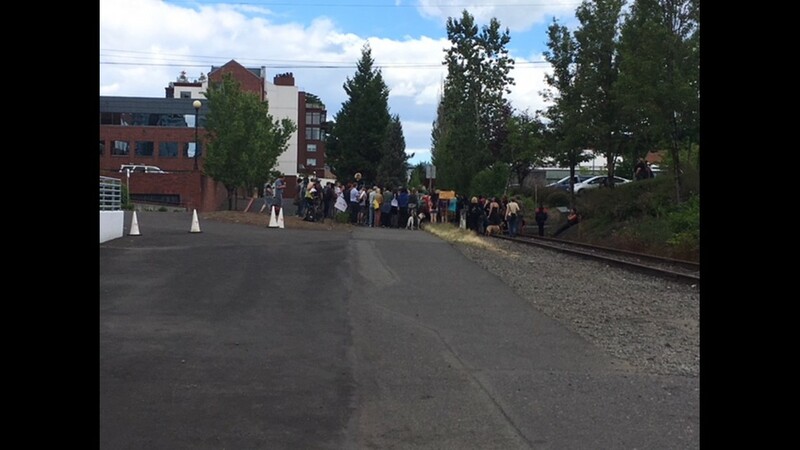 The group also tweeted, "Camp consensus: We don’t move until ICE is out of Portland and abolished." 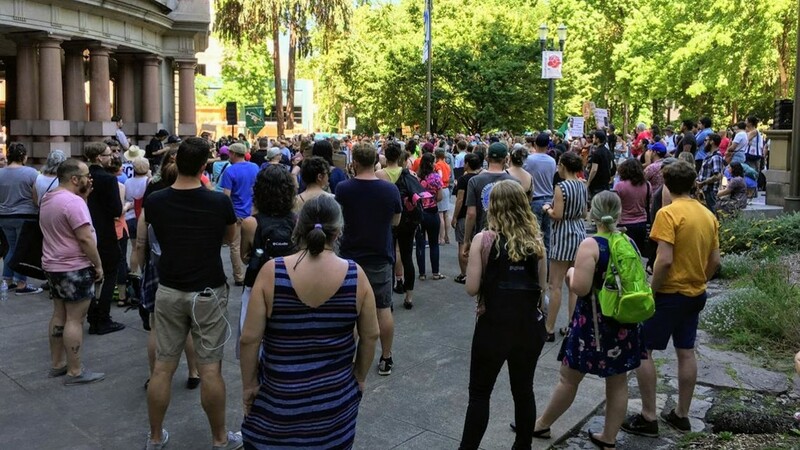 During a press conference near the camp Monday night, a spokesman for the Occupy ICE PDX said the campers wouldn't be going anywhere, and they planned to stand their ground. 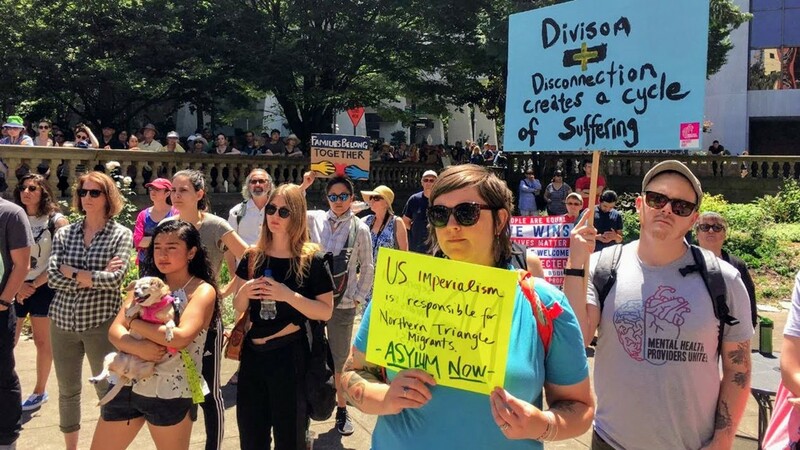 The Occupy ICE PDX demonstration began on June 19 at the ICE facility. 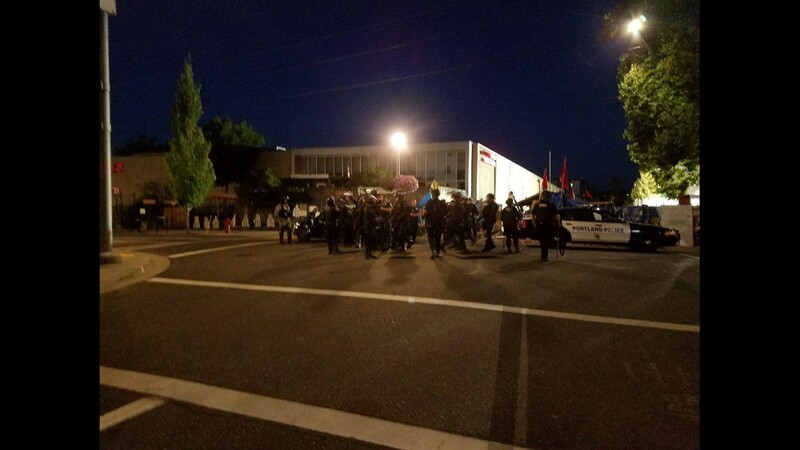 Protesters blocked employees from leaving the parking lots. 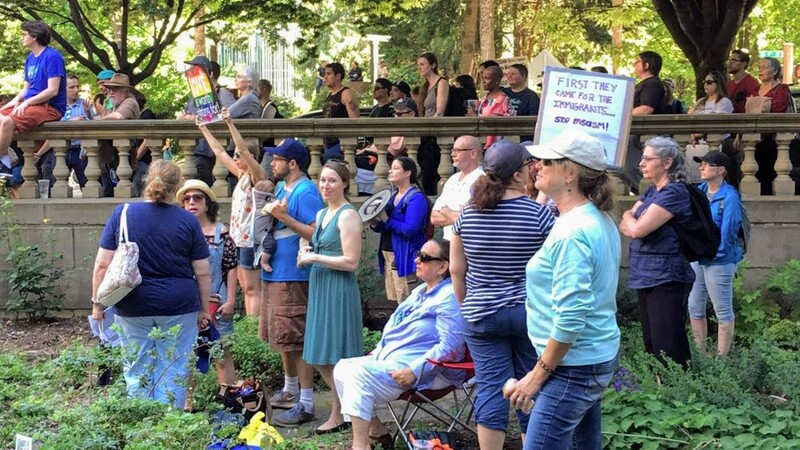 "Portland residents have a right to free speech and a right to demonstrate against policies that they believe are unjust and immoral," Wheeler said on Monday. Verify: Who owns the land protesters have been camping on? 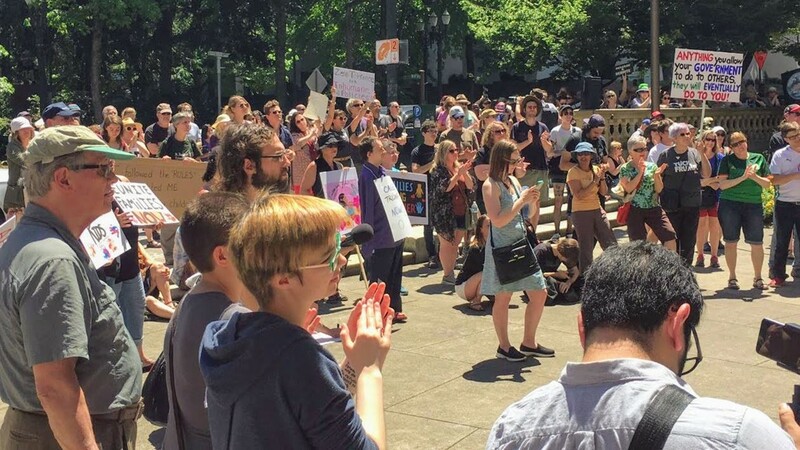 Occupy ICE PDX is primarily made up of Portland-area activists. 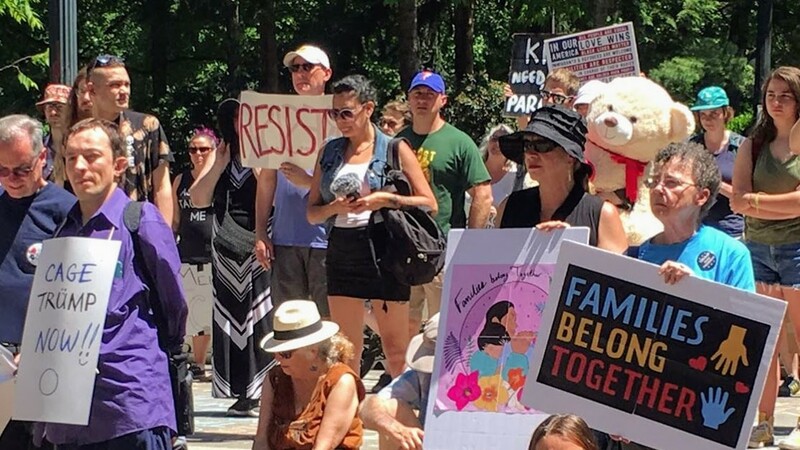 The group is demonstrating against Trump’s immigration policies and ICE, the federal immigration enforcement agency that carries out the policies. "There’s really two factions at the camp. 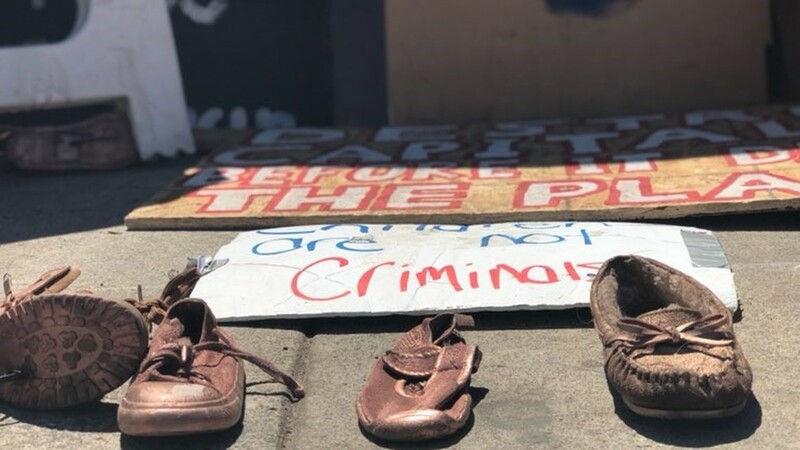 There’s Abolish ICE, who initiated the protest in the camp, and then there’s Occupy ICE," said Eudaly on Monday. 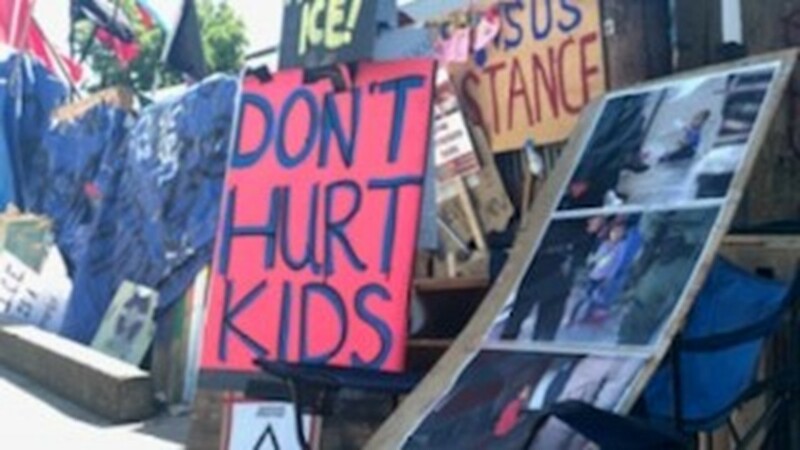 "And Abolish ICE is led by individuals who are more representative of the impacted communities and they have publicly stated (Monday) that occupation is a tactic, not a strategy, and this a long-haul effort and they are moving on. So what we’re hoping is that the other faction follows suit because we should be listening to the voices of the people who are most impacted by these policies. 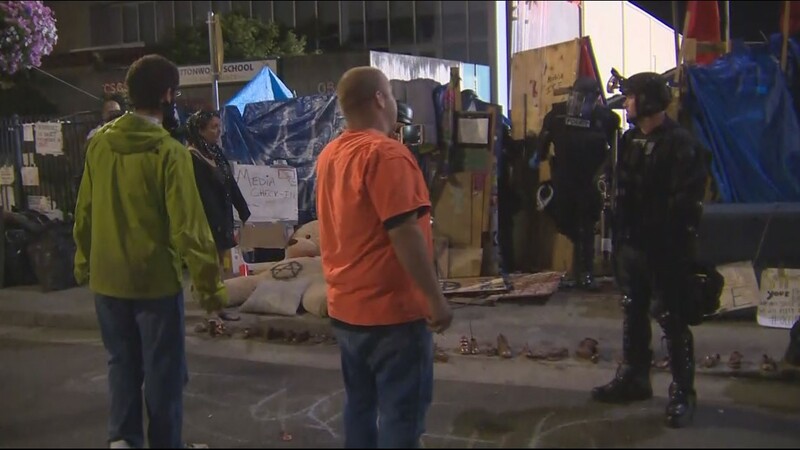 Federal officers arrested at least 18 people during the five-week protest. 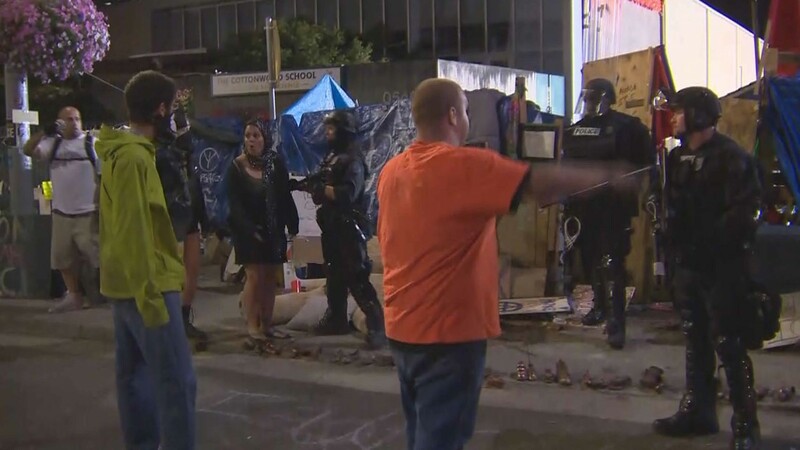 On Sunday, a food cart owner near the encampment told KGW that he was closing his business after protesters repeatedly threatened his daughter while she worked at the cart. "We're concerned about life and safety issues," Wheeler said.